A logo for Mr. Biden’s 2020 presidential run, left, and a campaign button from 2008. 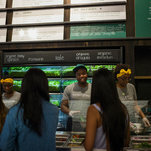 A Sweetgreen location in Manhattan in 2014. The company has been at the forefront of cashless transactions. 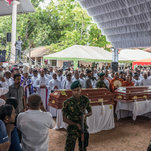 A funeral in Negombo, Sri Lanka, on Tuesday for victims of the Easter Sunday bombings, an attack that the Islamic State claimed responsibility for. Fearing retaliatory violence after ISIS claimed responsibility for bombings on Sunday, Muslims from Negombo, Sri Lanka, left on Wednesday for a safer location. On Wednesday, Detective Joseph E. Franco, who works in southern Manhattan, was charged with 16 criminal counts, including perjury and official misconduct. “It was always about protecting from the accidents, the suicides, preventing kids from getting guns,” said Assemblywoman Amy Paulin, who has sponsored a bill that would require gun owners with a child in the house to lock up weapons. Sam Knight writes about the teen-age climate activist Greta Thunberg, her visit to Parliament, and her response to the fire at Notre-Dame. Masha Gessen writes about the dread among the L.G.B.T. community as its members await Supreme Court decisions that would protect from discrimination on the basis of sexual orientation and gender identity. Woops, Looks like the weather service is temporarily unavailable. Please try again in 10 minutes.